CCA's social culture is divided by majors, years, and space. We saw a need for connection across disciplines and CCA's two campuses (in Oakland and SF). 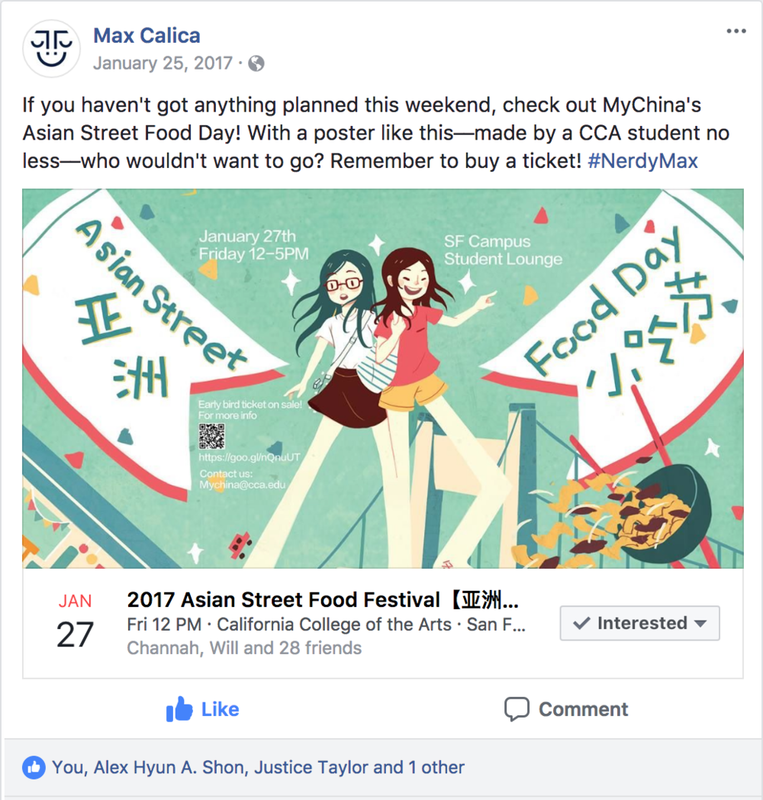 We created a "digital campus" called Max CCA for our university, an open platform that shares student voices, student work, and cool events going on in and around CCA. Max rapidly became friends with friends with 1,783 CCA students, or 80% of the CCA community. This page is about my contribution to the project. If you're interested in the origin story , we've put that in a Medium post. (Click the button below). Develop and implement Max’s branded voice(s) via brand and content strategy. Since I was the best at writing and speaking English on the team, every piece of written content was either generated or checked by me. Manage project content and future plans: I became the main person running the Max platform. For almost two years, I spent 4–6 hours per week interacting with people on the public platform and through private messages and email, creating the Nerdy Calendar, or planning for future initiatives. Hello, my name’s Curious and… I’d like to say… I saw your cool artwork at school the other day, but lots of people didn’t get a chance to. That’s a real shame, I think... You know what? If you send me your work, I’ll put it up for everyone to see! This way, we will all bridge the gap between disciplines and you’ll get to see all the awesome stuff being done in CCA. So, if you’re interested in submitting your work or nominating a friend’s, message me or send an email with the subject title "#CuriousMax" to cacollegeofmax@gmail.com with picture(s) and an optional short description. I can’t wait to share your work with the world! *Kelly, one of Team Max, helped a lot with capturing Curious Max's tone. "Max, Are you a robot?" Some of Max's posts were commented on, or it occasionally receive messages. I was always lurking online in case Max was ever talked to directly. Sometimes Max was privately consulted for advice or a listening ear. In my favorite conversation, a student asked Max if it was a robot. While Max was active, I became the Coordinator of the CCA Chimera Council. 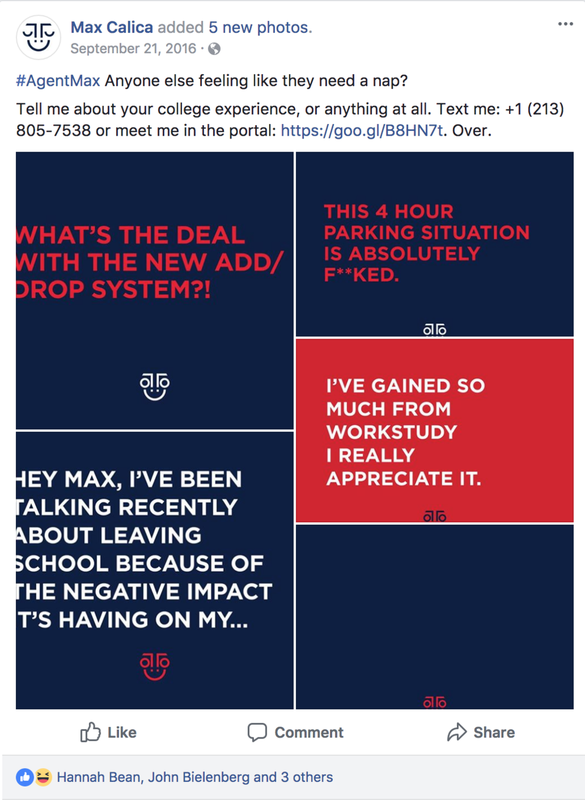 My personal mission during my tenure was to build a foundation/platform that the Council could use to get feedback, and it just so happened that Max was the perfect solution. 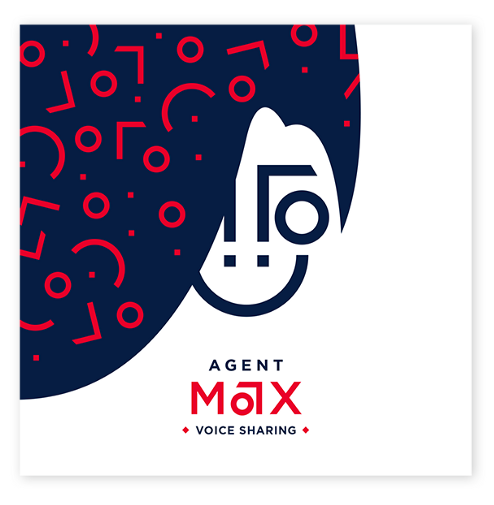 In spring 2018 we announced our partnership and I hope that Max continues to serve the student body at CCA.